Overall, this technology and the growing consumption of nicotine-containing vapor are so new that there is no way to know their long-term effects on the health of users or bystanders. In 2014, “vape”—meaning “to inhale and exhale the vapour produced by an electronic cigarette or similar device”—was the Oxford Dictionaries (new) Word of the Year. Despite being new and unproven, vaping intrigues many individuals addicted to tobacco products, particularly cigarette smokers. Might it allow them to wean off nicotine, safe from the toxic chemicals in tobacco smoke and without entirely giving up rituals of smoking? Expert opinion is mixed and regional. In the United Kingdom, the Royal College of Physicians urged smokers to switch to e-cigarettes after concluding the potential benefit outweighs the potential harm. In the United States, on the other hand, authorities such as the Centers for Disease Control and Prevention, the American Lung Association, the American Thoracic Society, and the American College of Chest Physicians emphasize the addictive power of nicotine and the lack of evidence regarding the safety of ENDS. They advocate restricting access or banning these devices until more is known. Some countries including Argentina, Mexico, and Thailand do ban e-cigarettes; others such as Denmark, Hungary, and New Zealand allow them only if the solution does not contain nicotine. The United Kingdom, Germany, the Netherlands, and others have no restrictions. U.S. experts direct smokers who want to quit to methods supported by research, such as nicotine replacement with patches and gum, bupropion (Zyban, Wellbutrin), and varenicline (Chantix). As of August, the FDA restricts manufacturers and retailers of ENDS from saying their products are “safe and effective” for quitting smoking until science backs that up. The World Health Organization took the same stance in 2008. Local laws creating smoke free areas such as restaurants and workplaces generally predated e-cigarettes. Whether the same restrictions apply was unclear; objections grew as some users of vaping devices assumed they were exempt. More and more states and municipalities now explicitly prohibit ENDS wherever they prohibit smoking. Some opposition to vaping stems from fear that young people will expose their developing brains to nicotine, and perhaps become addicted to other tobacco products. Some of that is happening. 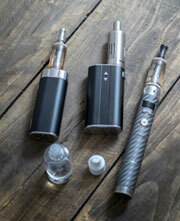 E-cigarette use by youth is on the rise even though their use of conventional cigarettes has declined. During 2011 to 2015, current users of e-cigarettes among high school students increased from 1.5 to 16.0 percent; among middle school students, from 0.6 to 5.3 percent. FDA regulations now ban sales of ENDS to individuals under age 18, and require ID proof of age through age 26. Prior to this rule, however, all but three states had already prohibited ENDS sales to minors. The FDA also stipulates that e-cigarettes and other tobacco products may no longer be given away, nor sold in vending machines accessible to young people. The new FDA regulations direct manufacturers and importers of ENDS to submit, by May 2018, detailed premarket tobacco product applications (PMTAs) for every component of new and existing products including every flavor and concentration of e-liquid, unless an item was on the market by February 15, 2007 or is “substantially equivalent” to a product that was. This requirement will be difficult and expensive to satisfy and is expected to markedly reduce the selection of ENDS available to consumers. Evidence of the risks of conventional smoking—including lung disease, cancer, and cardiovascular disease—is voluminous. The widely held belief that inhaling nicotine vapor is less risky than smoking may ultimately be proven correct. But that does not mean that nicotine vapor and the devices that produce it are benign. For example, some vapor may contain toxic or carcinogenic chemicals, nicotine may exacerbate heart problems, nicotine exposure in pregnancy can harm developing fetuses, nicotine solutions are poisonous to infants and toddlers, and lithium-ion batteries in ENDS have been known to explode, sometimes in the faces of users. If you are a smoker and decide to take your chances with vaping (If you are not a smoker why would you assume the risks? ), make yourself safer by cutting out conventional tobacco completely. Limit how long you engage in vaping. And resist identifying as a “vaper” or becoming a vaporizer hobbyist, which could embed the practice in your lifestyle.